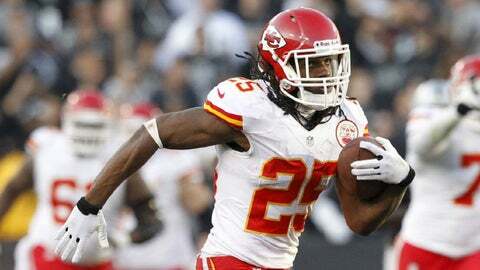 Jamaal Charles has caught 70 passes for 693 yards and seven touchdowns. That goes along with his 1,287 yards rushing, making him one of the NFL's most dynamic dual threats. KANSAS CITY, Mo. — Chiefs running back Jamaal Charles already has a declaration about his coach, Andy Reid, and the Chiefs’ staff: They are the best he’s had in the NFL. Charles, 27, probably is just being grateful for getting a week of rest after absorbing a pounding for 15 games that featured a career-high 329 touches. "I definitely feel better," he said Tuesday. "I know what’s at stake this week so it was good to get the rest. My body feels really good going into this week. "There is no soreness and no pain anywhere. The coach and the coaching staff are probably the best since I’ve been around here. What they did with resting the guys, we definitely notice the importance of that." Not that Charles has minded all the attention he gets in Reid’s offense. He had heard when Reid was hired that he would be featured the same way Reid used his tailbacks in Philadelphia — plenty of running plays and plenty of receiving plays. "You can see for yourself on film how they utilize me," he said. "I’m in space or I’m in the slot and they put me in places where I can catch the ball. I get screen plays or other plays out of the backfield. "I think I did that my rookie year, catching a lot of balls out of the backfield, and now they’ve brought it back. I love it." Charles has caught 70 passes for 693 yards and seven touchdowns. That goes along with his 1,287 yards rushing, making him one of the NFL’s most dynamic dual threats. And Colts coach Chuck Pagano realizes that as much as anyone. When speaking to reporters this week and asked what his biggest concern with the Chiefs was, Pagano said bluntly, "Jamaal." Pagano elaborated: "We call him Public Enemy No. 1. He’s the guy that has our attention because first and foremost you have to stop him." The Colts didn’t really contain Charles the first time the teams met two weeks ago at Arrowhead Stadium. Charles gained 106 yards on 13 carries and also had five receptions for 38 yards. But the Chiefs seemed to game plan away from Charles as the Colts pulled away to an eventual 23-7 win. "I never question the game plan," Charles said. "It will be different (this time)." This time, too, there is more at stake, and Charles knows it. His one experience in the playoffs was a 30-7 thumping by the Ravens after the 2010 season. "The first time I (played like a) a rookie," he recalled. "I fumbled the ball twice. Now I’ve come in here the second time to the playoffs and I’m like the vet even though I’m 27 years old. I really want this. I want to go far. I’m really excited in taking this (leadership) role." Just making the playoffs has been a breath of fresh air for Charles, who has endured two 2-14 seasons in his short career, along with the bizarre and horrific Jovan Belcher tragedy last year. The pain of those experiences make this week even more special. "I would say so," he said. "The last couple of years there have been all kinds of situations — losing, the tragedy, things that open your eyes up a lot. "You see guys work so and you want things to happen your way. Now we have a chance." But just making the playoffs won’t be enough, Charles said. "Oh yeah, definitely (not)," he said. "I’ve been to Super Bowls for events and it’s hard when you’re not actually in the Super Bowl. Going to them is fun but not being in them is no fun. "Our goal is to go to the Super Bowl."